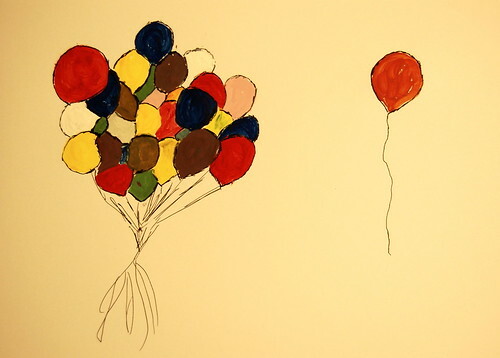 Balloons, paint, pen & ink on vellum, Harrisburg, Pennsylvania, December 2010, photo © 2010 by Louis Robertson. All rights reserved. I see layers. Color. Community and separation. Vellum, which resembles parchment paper, is an unusual medium which was once prepared from the skin of a young animal, like calf or lamb. The word is derived from the Old French Vélin, for “calfskin.” These days paper or vegetable vellum is commonly used for technical drawings and blueprints. I always look at paper and media choices when I look at art. Process is important to me. Maybe it’s a piece about process. On the other hand, the painting could simply be a bundle of balloons. What do you see in his painting? What does it mean to you? Hello From L&P Sock Puppets Invade Osteo, Harrisburg, Pennsylvania, September 2010, photo © 2010 by Pam Wilshere, haiku by Louis Robertson. All rights reserved. Louis wrote with us a few weeks ago when he was inspired to join us on the WRITING TOPIC — SCARS. He also sent along a photo of his liver transplant scar (not for the faint of heart). To meet Frankenbelly 2 and learn a few things he’d like to pass along to his kids, see his Writing Practice post PRACTICE — SCARS — 15min. 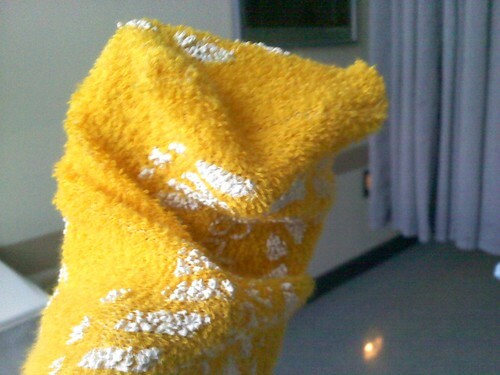 Thank you L&P Sock Puppets. You lifted me. I have so much gratitude for the gift of family. And laughter. This list is a work-in-progress and represents some of the lessons life has taught me. I started it as a “gift” to my children and wanted it to be something they could return to again and again to help put things into perspective and to add focus to their lives. QuoinMonkey, whose opinion I have always trusted, encouraged me to share it with a larger audience. I agreed hoping that the readers of red Ravine may find something in this they can use. 1 – As long as you remember me I will stay alive in your memories. You are my legacy, my magnum opus. 2 – I am very proud of the person each of you has become. Although I did not say it as much as I felt it, you are the source of my joy and pride as a father. 3 – You can achieve anything! If you can imagine it, you can do it, but it will take hard work. It will not come easy, but if you believe in your ability to achieve, know you have the desire to see it through and persevere, then it can happen. Oh, and a good plan helps. 4 – Everyone has worth! Even the marginalized — especially the marginalized — have something to contribute to your life. You need to work beyond the visceral feelings, put yourself in their place, and look for the lesson. 5 – You are constantly being presented with opportunities to learn and grow. God doesn’t give things to you, rather he allows opportunities to be presented to you and it is your responsibility to recognize them, learn from them, and grow. 6 – Don’t get stuck in the past. What happened, happened. No amount of rehashing, bitching, complaining, or wishing will change the fact that it happened. Look for the lesson and move on, but understand that sometimes it may take years for the lesson to present itself to you. 7 – When someone has the ability to really irritate you, either by their actions or beliefs, step back! Try to identify what is bothersome and put a new face on it. For example, that person who is always butting into your conversations? Ask yourself, What purpose does this serve to them? Are they lonely, feeling marginalized, friendless, or just trying to get noticed? Then wonder what their self worth may be to have to do this to feel alive, noticed, or a part of something. Maybe even wonder how things must be at home for them. Now ask yourself “How can I help them feel better about their life?” But also remember, sometimes people are just jerks. 8 – Always remember that you are loved and have a large family to fall back on when things are tough. Don’t be afraid to ask for help; it is not a sign of weakness. It took me 43 years to realize that allowing people to step up and take some of the burden from me is often a gift to them. 9 – Remember the lesson I taught you as a kid about power. You have a reservoir of power that you control. Be stingy with who you give it to. That kid that knows he can make you mad by calling you fat is taking away some of your power. To get it back you need to be aware of your reaction and change it. This will not only help you with your personal interactions but is essential when trying to break a cycle of reactionary behavior. Once you fall into a pattern, the pattern will repeat itself until something changes. Changing your reaction will make the interaction more real and will cause you to look at it from another perspective. Once you change the pattern it will either fall apart or create a new trigger to a new pattern. Listen to that little voice that says, “Why do we always have the same argument over and over?” and use that pause to look for the pattern, and then change it. 10 – Make at least one person smile every day. Find something to compliment them on. Do something unexpected for them. Tell them they are important to you. Some days it may be the catalyst that changes their lives or the start of a chain reaction of passing the smile on. When you are given the choice, make a positive impact rather than a negative impression. About Louis: Louis Robertson (R3) is a divorced father of two teenage children who lives in South Central Pennsylvania. His day-to-day life centers on his children and teaching them about responsible living. He earns a living as a computer systems consultant. Louis has experienced medical challenges since he was a teenager. After his first liver transplant in 1993, his perspective on life became more focused and his appreciation for the little treasures life grants increased. When he learned he needed a second liver transplant, his focus moved to preparing his family and children for a future without him. He now is a candidate for a third liver transplant and lives his life watching for life lessons he can pass on to his children.